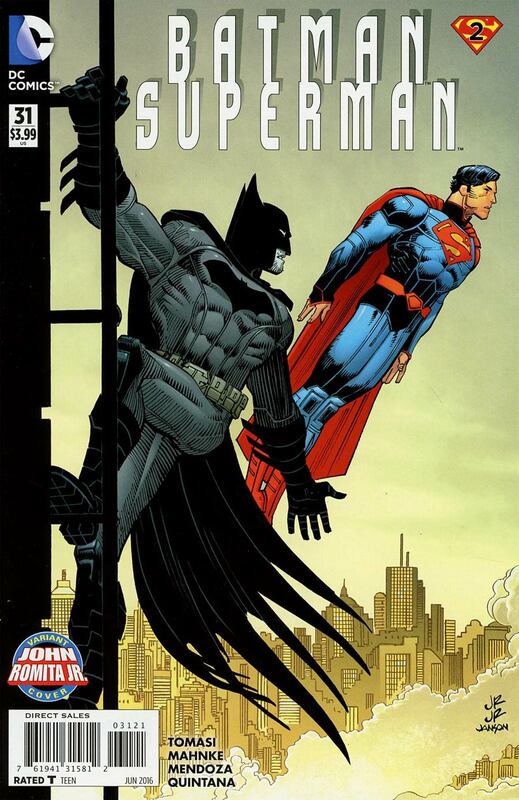 "The Final Days of Superman" - Part 2: "Dark Discovery"
Clark flies to Gotham to meet with Bruce. Batman is fighting Tusk and a gang of other mutant criminals. The fight is taking up too much time, which Clark is severely lacking, so he ends the fight for Bruce and turns to his friend to seek his aid. Upon reaching the Batcave Clark reveals his current predicament and though Bruce is reluctant to accept it he sees how Clark has grown to accept his fate. Clark seeks one final favor from his friend, to seek out his only living relative, Kara, Supergirl. As Superman says his final goodbye to Alfred and flies away Batman, sits in silence, smashing a monitor with his fist as his only outlet of rage. In Metropolis, the fugitive empowered with 'Superman' energy flies into a burning building and rescues trapped citizens. Before he can leave he meets Jimmy who recognizes the shield but is surprised that the stranger knows him. As he soars skyward the energy suddenly cuts off and the fugitive crash lands onto a young boy's rooftop bird coop. When the boy demands compensation for the damage the fugitive angrily pushes the boy off the roof. An explosion of energy occurs and he is 'Superman' once more and rescues the boy before racing away. Superman returns to Bruce in the evening and Bruce questions his excessive super deeds when he could be conserving his energy. Clark changes the subject and Bruce points down at the cafe Kara was working at when she lost her powers. Clark knew she was living as a human in New York, but he didn't know where she vanished to. Bruce reveals that Kara seemingly left to go to National City. Suddenly "CHOU XIE!" is being yelled by multiple attackers. 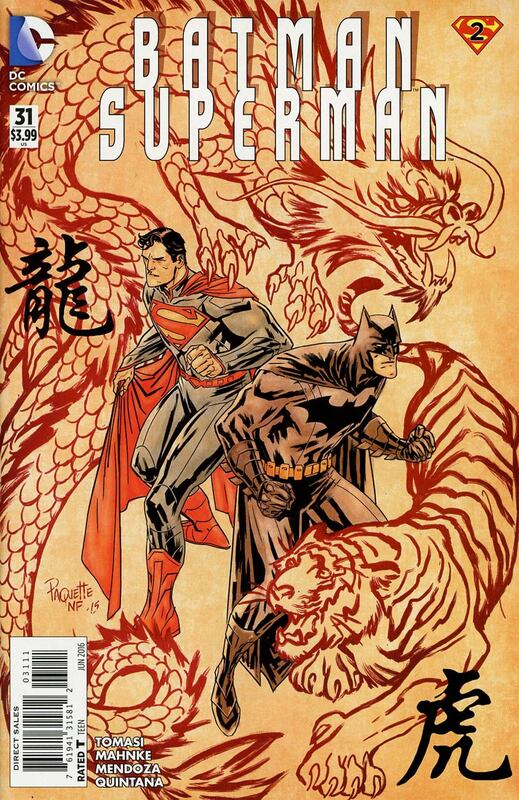 'The Four Pillars' are the embodiment of the Chinese Zodiac and for some reason they attack the World's Finest. The fight rages until Clark & Bruce gain the upper hand, but instead of giving in the creatures all commit suicide. All but one dies, this final foe rips the flesh from Superman's neck before teleporting away. Superman examines his wound, it is slowly healing but he realizes he is beginning to fade and with determination tells Bruce that he is heading for National City immediately. Story - 5: A solid chapter! Bruce newly back as Batman is just in time to hear he has no time left with his closest friend. The goodbyes were horrible to witness, mainly because of the finality of it all, not only that but in Bruce's eyes, Clark has thrown in the towel. Being powerless to act is alien to him and it shows. The Super League thread is interesting, but it's still to early in the story for it to flesh out further so I'll wait on that. At the moment it's got a feeling of Deadman to it. Bringing in the Supergirl TV series as continuity or at least elements of it is interesting. I just hope Clark lives long enough to rescue his cousin. I didn't mind the issues with Supergirl in the intergalactic academy but this is a better direction. Art - 5: Doug Manhke continues to impress. Now that Clark is not in the T-shirt get up and is looking a bit more like his old self, we're reminded of what we missed. One more reason to feel a little down. Saying goodbye to a Superman that has spent his entire run since 2011 being unhappy and continually kicked in the gut... to see him smile meeting Bat Cow... it may sound silly but the combination of this art and this story is just fantastic. The new Batman suit isn't fantastic, but then it's designed more to be stealthy. Bruce without the cowl spoke more to me than the caped crusader. With only one issue to go before cancellation I think I will truly miss the Tomasi/Mahnke team. Cover Art - 4: Brilliantly rendered but let down by a dull color palette. I like the feeling of Chinese tapestry. It looks like a real comic book version of the Admonitions Scroll with the fluid brush strokes. It just seems a but like its coloring is washed out, but the composition is screaming for color and energy. It looks like a sketch, an image in planning, it lacks any kind of dynamism.